The post has been upvoted 626 times on a social news site that hosts an audience that fits the exact profile of the type of person who would shop on newegg.com and honestly, I feel for newegg because I’m sure if you asked them the impetus for integrating topic clouds into customer support pages, they would respond by explaining that the clouds help customers find solutions to their issues faster. For the uninformed, topic clouds are designed to show which words within the body of content on a site, forum, blog, etc. is the most popular. Popular topics or “tags” are represented in larger or bolder fonts than others. Topic clouds can be extremely useful to help categorize conversation. But in this incident, if I’m newegg, I’m putting the breaks on immediately and determining what makes the experience so disappointing (as noted by two of the largest words in the cloud). This all seems relatively familiar, well at least pieces of it. When Jeff Jarvis penned a complaint that sparked a social media renaissance via his seriously appropriately titled “Dell Hell” open letter on his blog, he detailed his negative experiences dealing with Dell’s inept technical support team. His rant turned into a meme and before you could count to 10, Dell was instantly labeled as a tarnished brand that didn’t care about its customers. The reputational value of Dell took such a significant hit that all facets of the company were impacted, including its stock price, leading to the company to investing hundreds of millions of dollars into correcting its issues. Today Dell has seen the fruits of its investment – leading B2C social media efforts on channels such as Twitter, where customer support leaders within the organization frequently tweet with Dell customers. The days of Dell Hell are in the rear view mirror. 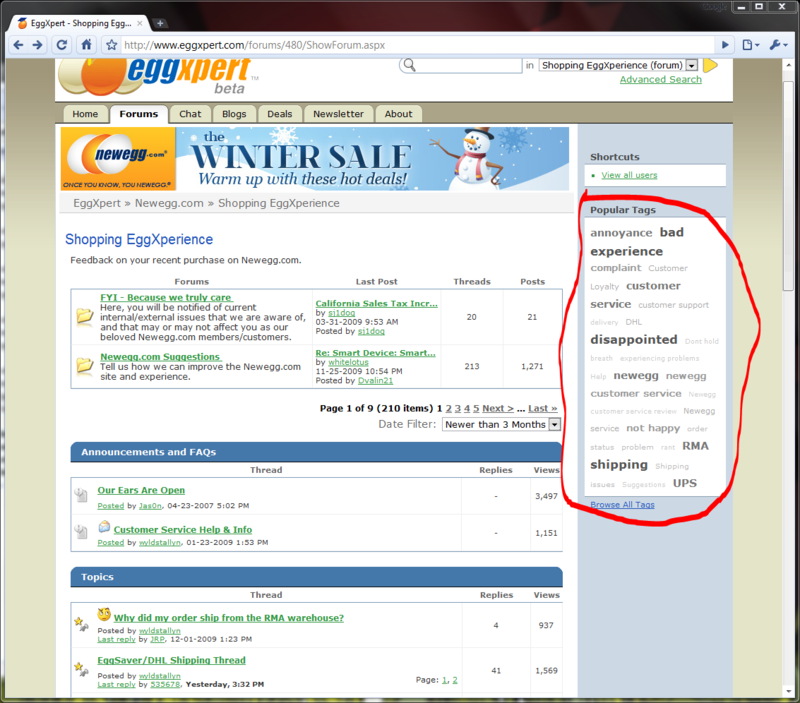 But for other brands such as newegg, objects seem closer than they appear. Hopefully they learn a lesson as a result of their poor technical support, and work to fix it immediately. For a better idea, maybe they should have tag clouded which products appeared the most. I'd be really wary of a gadget that had it's name big and bold in a support or complaint forum tag cloud.